We introduce quantitative usability and security models to guide the design of password management schemes — systematic strategies to help users create and remember multiple passwords. In the same way that security proofs in cryptography are based on complexity-theoretic assumptions (e.g., hardness of factoring and discrete logarithm), we quantify usability by introducing usability assumptions. In particular, password management relies on assumptions about human memory, e.g., that a user who follows a particular rehearsal schedule will successfully maintain the corresponding memory. These assumptions are informed by research in cognitive science and can be tested empirically. Given rehearsal requirements and a user’s visitation schedule for each account, we use the total number of extra rehearsals that the user would have to do to remember all of his passwords as a measure of the usability of the password scheme. Our usability model leads us to a key observation: password reuse benefits users not only by reducing the number of passwords that the user has to memorize, but more importantly by increasing the natural rehearsal rate for each password. We also present a security model which accounts for the complexity of password management with multiple accounts and associated threats, including online, offline, and plaintext password leak attacks. Observing that current password management schemes are either insecure or unusable, we present Shared Cues — a new scheme in which the underlying secret is strategically shared across accounts to ensure that most rehearsal requirements are satisfied naturally while simultaneously providing strong security. The construction uses the Chinese Remainder Theorem to achieve these competing goals. 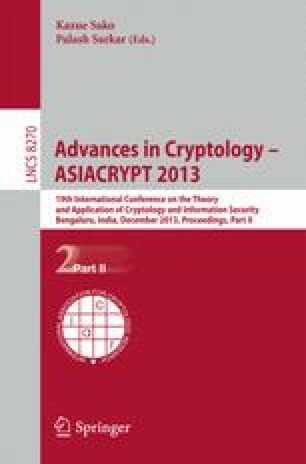 This work was partially supported by the NSF Science and Technology TRUST and the AFOSR MURI on Science of Cybersecurity. The first author was also partially supported by an NSF Graduate Fellowship.